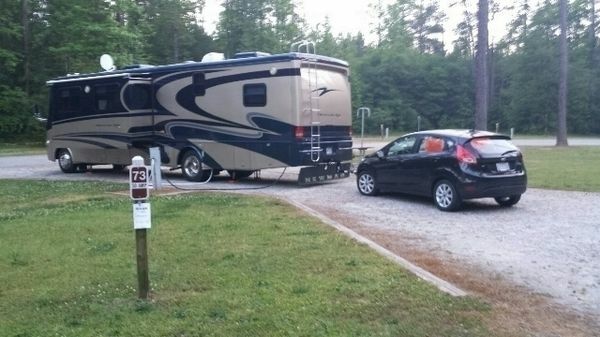 NOTE: would like to sell as a complete package RV < TOW EQUIPMENT< AND MY 2012 FORD FIESTA COUP SPORT MILEAGE 31000+ will sell (separate)ALREADY SET UP TO DRIVE OFF....Very nice coach for sale, this is a workhorse custom chassis ,New tires Nov. 2014 Michelin 22", Set up for a washer & dryer, queen bed, fold out couch & recliner, Hvac, plus gas furnace, 7 kw generator 100 plus hours on it, water heater gas or electric, auto jacks, Will need to see how nice this coach is an runs like new, $55,,000.00 Note: vehicle has a handicap lift by front door,used for sitting or standing to help in assisting in entry. ( vehicle not wheel chair accessible.) Also will Sell the Tow Vehicle for $13,500.00.. This vehicle is also set up with a Tow package cost of around $3,400.00 (dollars) .